Carl Wright was born in Washington DC. Growing up in a suburb of green lawns, that was in deep contrast to the sharp-edged grayn ess of DC led Carl to embrace opposites in form & color. Through traveling in the western United States particularly in Texas & parts of Indiana, he gained a greater appreciation of how form can be the focal point in a large area, be it nature or in a cityscape. A whisper in a large area can reverberate like a roar – particularly with sculpture. Carl completed a BA at Shepherd University with an emphasis in Fine Art & Business after studying at various schools including the Maryland Institute, College of Art in Baltimore, the University of Maryland, & Arrowmont in TN. 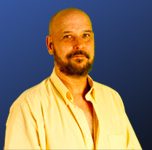 He has traveled extensively in the United States & to a lesser degree in Italy - Rome & Florence. Carl uses stone to highlight the many opposites that he encounters: the warm design in the stone contrasted with its’ cool hardness, the light that splays through the sculpture with stones’ reputation for solidness, the color of the stone in contrast to its’ surroundings & the rough texture of his bases to the shimmering smoothness of his sculpture that imparts a tactile delight. He continues to expand his vocabulary of shapes & sweep of design which is reflected in his five sculpture themes: the Music Series, the Tranquil Series, the Exuberant Series, the Striving Series, & the Motion Series. The Music, Tranquil & Exuberant Series are series on uplifting life-affirming topics such as tranquility, emotional bonds, & how music knits together the tapestry of life. These sculptures give a respite from the day’s work & are a singular joy to be around. The Striving & Motion Series are more reflective of the hurly-burly environment that most commuters & workers encounter in their day to day environment. These sculptures reflect themes of busyness, constant motion & moving towards professional/career goals. These sculptures reinforce the idea that work/commerce is being completed. 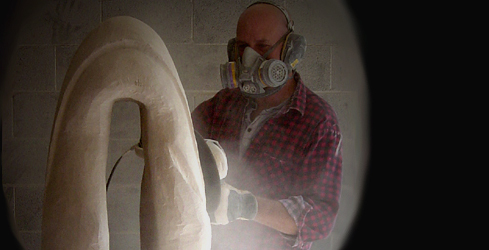 Carl’s sculptures are represented in private & corporate collections & in Public Art Exhibits. He has extensively exhibited in the USA for the past 14+ years. Selected Public Art Exhibits include: Northshore Sculpture Park in Skokie IL, Courthouse Galleries in Portsmouth VA, City of Baltimore, Algonquin, IL, & Tamarack in Beckley WV. His work has been shown & purchased in private galleries in Washington DC, Richmond, VA, Chapel Hill, NC, Scottsdale, AZ & Lancaster, PA. He maintains a studio/gallery in Martinsburg, WV. All Carl ever wanted to do was make work that reflected his love of the shapes, colors & textures of this world & use that work to tell stories visually. Carl’s stone sculpture is about transcending the moment, independence, personal growth, the opportunity to succeed, and how other ephemeral mediums like music can be decoded into stone. Whether the sculpture subject is about music, emotional bonds, the act of being busy or constant motion, Carl enjoys translating fleeting concepts through the universal language of abstract sculpture into tangible realities. Everyone needs to be reminded of the beauty that surrounds them: in the touch of a loved one, the slow thrill of watching a plant grow, a fiery sunset, or the beauty of a sublime stone sculpture. That is why he carves.